I see a lot of boulder walls in landscapes where the same need – keeping a hill in place – could have been accomplished instead by installing boulder outcroppings. 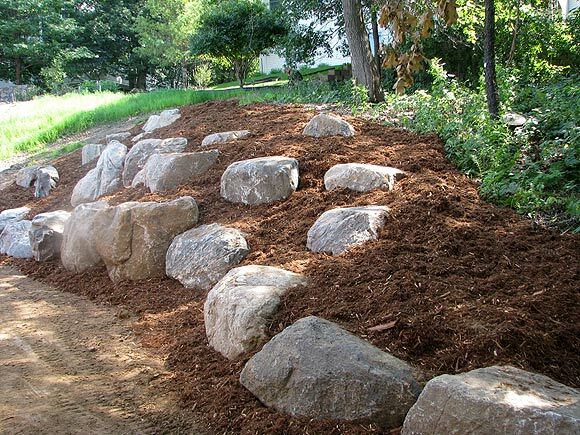 Boulders used in outcroppings are BIG – a homeowner could never install them – but in all cases, these large boulders will keep a hill or otherwise higher portion of a property in place for the next 2,000 years. Boulder walls – typically made from smaller boulders and stacked, like cannon balls – can fail in periods of heavy rain. Boulders crashing into the car, side of the house, or swimming pool, are never a good thing. It depends on the angle of the grade. If it’s the homebuilder cutting sharply into a hill to install a driveway, leaving a vertical or near-vertical wall of soil, yes, a boulder wall is in order (or, a vertical wall of concrete retaining wall block, God help you). Often I’ll see milder slope, perhaps 45 degrees, where a landscaper built two, or even three, boulder walls, in terrace fashion, to retain the soil. Why not a single swath of boulder outcroppings instead? Instead of terracing, even a steep grade – 75 degrees – can be securely held in place via outcroppings. 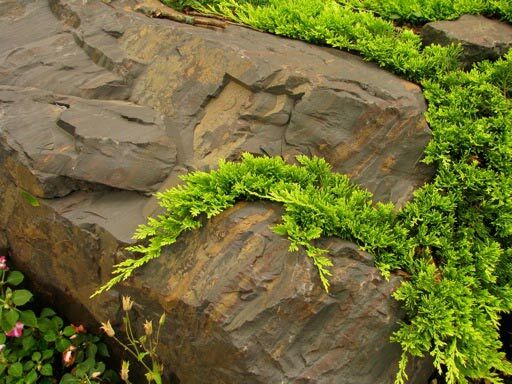 The huge advantage being that unlike a boulder wall, a boulder outcropping area can be planted, naturalized. Instead of dead faces of stacked boulders around the property, you see plants, with the boulders as textural accent.